Here are the songs from our brand new CD!! 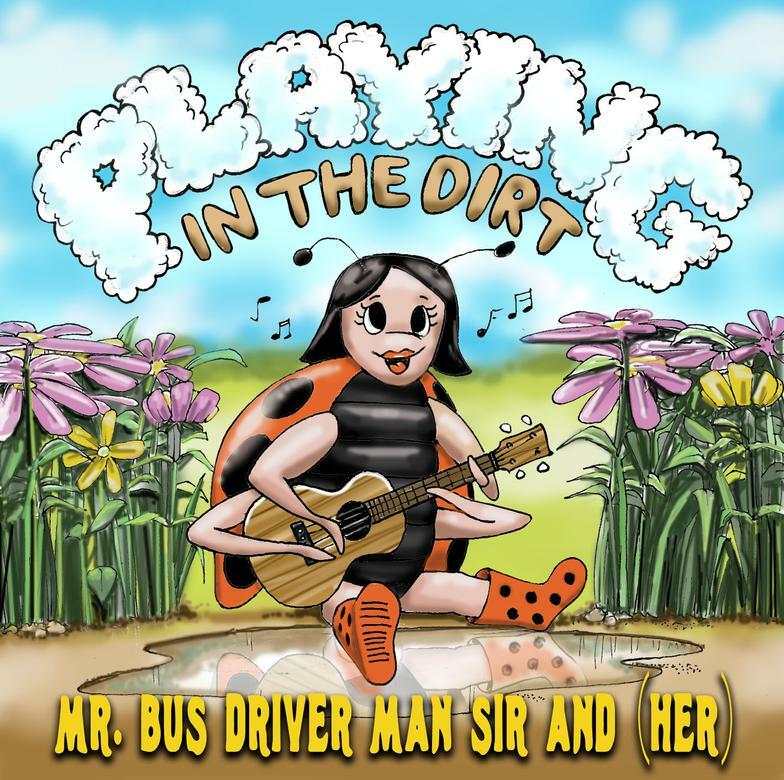 Jimmy Joe wrote Playing in the Dirt to show that kids don't need expensive toys or high tech gadgets to have fun. One day after school, two girls sat down in Jimmy Joe's bus when it started to rain. The girls knew they weren't supposed to leave the bus but they couldn't resist. They said, "Mr. Bus Driver Man Sir, can we play in the rain?" Mr. Bus Driver Man Sir could not say no. He watched with a smile as the girls danced in the rain. Can I have some new shoes? I’m just having some fun? Can I have a new shirt? I just ruined this one. Chrissie and Jimmy Joe live in the country with cats, dogs, chickens, goats and ducks. Among the flock of chickens is a very special frizzle bantam named Little Frizzle. Little Frizzle is tiny with black curly feathers and a bit of an attitude. She doesn't hang out with the other chickens. She prefers the company of her best friend Mr. Duck. Sometimes she lays teeny tiny eggs. Little Frizzle, will you ever lay an egg? Chrissie and Jimmy Joe met at one of the biggest farmers markets in Austin. Jimmy Joe was booking the music there, and Chrissie was looking for a gig. Years later, they are married and making music together, including every Saturday at that same farmers market. Casey has been the face-painter and balloon-artist at that market for years. He always dances to the music when he isn’t painting a face, and he is a bright and wonderful part of the market, so Chrissie decided he needed a song. He loves it, and when they sing it every week during the kids music hour, Casey spins his umbrella and blows bubbles to celebrate his song. Chrissie and Jimmy Joe love to play instrumental music on their guitars and they wanted to share this love of instrumental music with children. They often seek out music by other guitar duos to get new ideas. They discovered a lovely duo out of England called The Amber Rose Guitar Duo. They really loved their interpretation of this old children’s song and realized it would be perfect to add to their repertoire. They have a big brown teddy bear named Theodore who accompanies them to all of their children’s shows, and they always dedicate this song to him. Chrissie and Jimmy Joe were invited to play at the Zilker Botanical Gardens Festival in Austin several years in a row. They offered to write a garden song for the event. And, of course, playing at a farmers market every week, they know some folks who have VERY BIG gardens. And bring it to your house, fresh crispy treats that we can munch, Munchity Munch Munch Crunch!! It was the 4th of July (Chrissie’s favorite holiday), and Chrissie and Jimmy Joe were at the park watching fireworks. Chrissie said to Jimmy Joe, "You should write a song about things that go Boom!" So now I’m playing on my five-string banjo when I sing. Chrissie was talking one day with a musical colleague (Andi) who was generous with her advice and help. Chrissie thanked her, and Andi said that it is better for all of us to try to help pull each other up and not try to drag other people down because when we do, we all lose. Andi shared a story of her grandmother, who lived in Louisiana, as an example of how NOT to be. When crawdaddies are in a bucket, one might almost escape, but the others drag him back down. That inspired Chrissie to write this song about NOT letting others pull you down. When it was time to record, Chrissie asked Andi and her husband to sing harmonies on the song that she had inspired, which was an extra treat. But he jumped out, left them behind. Ellen's Ride chronicles a real life bus route in which Jimmy Joe drove a little girl named Ellen to school every morning for several years. The route unfolds through the combined eyes and imaginations of bus driver and rider. Ellen, now a middle school student, played cello on the track. Keep your mind open and ask, "What if?" It's nice to see you, how do you do? This song started its life as a saxophone song called “Yakety Sax,” but the famous Chet Atkins did what he did so well--made an outstanding guitar arrangement of this song. Chet Atkins is one of Jimmy Joe’s biggest influences. And since Chrissie and Jimmy Joe always introduce this song as the funniest song without words that you’ll ever hear, they thought it would be a fun addition for their children’s CD. Chrissie heard an interview on NPR with comedienne Sarah Silverman,who told a story about how she would buy fancy little dresses for her nieces. She would bring them the dresses and whisper to them to keep a secret...that she was really a princess. She would say that these were her old princess clothes that didn’t fit anymore, and she wanted to pass them on to the girls. This was so touching that it made Chrissie cry and she had to immediately start writing this song. Maybe someday Sarah will even get to hear it. I have a handsome prince. Jimmy Joe wanted to write a song for his niece Sydney when she was two. What came out was a story about Sydney's fun, crazy and slobbery dog Timber. you're the craziest dog I ever met! It was the day before Jimmy Joe was going to play music for a kindergarten class. The teacher called him to ask if he had any songs about ladybugs as they had been studying ladybugs in school. Jimmy Joe said, "Not yet." He took his little guitar to the park and sat down under a tree to try write a ladybug song. Just then a little orange ladybug landed on Jimmy Joe's shoulder. As legend goes, Jimmy Joe didn't really write the song. Miss LaLa, the little orange ladybug, taught it to him. Jimmy Joe took a class on a field trip to the zoo. He was inspired to write this song after visiting with the animals. Look up there do you see the giraffe? I've seen a neck quite so long, have you? Look over there do you see the elephant? I've never seen an animal quite so huge, have you? I've never seen a cat take a bath on its own, have you? I've never seen a monkey so angry, have you? I've never seen a bear so grizzly, have you? I've never seen a cat so spotty, have you? Chrissie started writing songs because she’s a mom. She had been playing guitar for years, but never thought to write songs until her son was born. Then she would make up little ditties to calm and entertain him. This was one of the first songs she ever wrote, and her son, who is now a teenager, still loves it. Dedicated to Sydney, River, Kiéran, Jeremiah, and Jackson. And especially to Pops. We will forever keep your love and humor in our hearts. Disclaimer: No banjos were actually harmed in the making of this album.